Coverage of the women’s division at Santa Barbara Invite is presented by VC Ultimate as part of their season-long support of our women’s coverage. All opinions are those of the author. Please support the brands that make Ultiworld possible and shop at VC Ultimate! Every January, a handful of Southwestern teams leave their already-warm campuses to warm up against their regional rivals in an early season jaunt. While the last year’s weather has been uniquely cruel to California, the upcoming weekend should feature calm skies and high-60s temperatures. Tournaments this early rarely contain harbingers for bid allocation or placements at Nationals. Last season, however, this weekend was the opening bell for one of the Southwest region’s strongest years in history. ((The region won four bids in 2017; the points Southern California picked up at SBI meant the difference between four bids and three.)) While the cards have been shuffled in the region, the Santa Barbara Invite will be the first attempt to answer the question: can the Southwest dominate the country again this year? Here are the pools heading into the weekend. Can Stanford Still Dominate in the Southwest? #3 Stanford is the only team in the country that can lose 47% of their goal scorers and 39% of their assist throwers from last year’s Nationals, and still seem like an elite contender1. They graduated Superfly institutions like Monisha White and Anne-Marie Gordon, and graduate student Courtney Gegg elected not to play this season despite having eligibility left. Even with these strikes against them, their deep program coupled with the addition of Julia Butterfield (Notre Dame, 2017 OPOTY Runner-Up, 2015 Breakout POTY) sets Superfly up for another strong season. But can they keep their surging Southwest counterparts at bay? Stanford should have no trouble in their pool, but they’ll have to contend with California, USC, UCLA, and UCSD in the bracket. While Stanford went undefeated at this tournament last year, these Californian teams are familiar with Superfly’s bag of tricks, and they’ll all do their best to topple the dynasty. But first, they’ll have to crack the puzzle of containing Butterfield and Shayla Harris. #19 UCLA has taken second in the Southwest for the past three years, but they’ve bid farewell to nine core contributors who were responsible for 77% of their goals and 86% of their assists at Nationals last year. 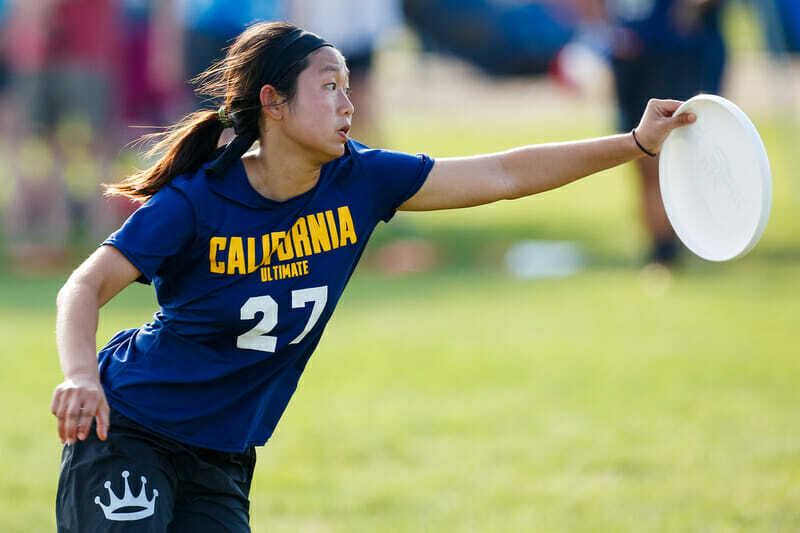 They will sorely miss the height and sheer firepower that their Callahan finalist Han Chen brought onto the field, but they will also miss the many athletic cutters and defenders that graduated with her. Junior Jane Gunnar and senior Caroline McKee will take up the reigns for UCLA, but expect a rebuilding season from this program. BLU is the most vulnerable they’ve been in years, right as the #7 California Pie Queens are coming into their own. Look for junior handler Anna Wysen and senior cutter Jackelyne Nguyen to lead the action for the Pie Queens. And yet, if anyone’s expecting Cal to be overly reliant on their stars, they haven’t been paying attention to Manisha Daryani’s system. Their team is far deeper than two flashy playmakers and shies away from relying on top end production. Cal’s cutters work hard to generate opportunity, and they’re no stranger to that long ball life. The Pie Queens hustled their way to the Santa Barbara Invite final last year, and they’ll be hungry to return this season. This tournament won’t define these teams’ standings in the region—far from it. But they’ll have their first shot at each other in yet another long season. Is USC Taking a Step Back? USC began last season with a blaze of glory, but at Southwest Regionals they failed to claim the bid they’d earned for the region. Last year the Hellions could pack a punch, but they also had a penchant for playing close games that tired out their top players. And this season, they return without a lot of the talent that kept them hot last year: Julia Johnson, Connie Chan, and Rachel Chang all graduated. Captain Alyssa Perez will still be one of the most ferocious cutters in the region this season and Alana Archer is a tough multitool player, but the Hellions may need more depth if they want to recreate last year’s magic. Southern California may turn to their new young recruits to fill in production. They’re the no. 4 seed in the tournament with a tough pool, which gives them the perfect challenge early: can they close out games and earn another bid for the Southwest this year? How High is the Ceiling for UCSD? Last year, #11 UC San Diego drew some attention at Santa Barbara Invite when they upset top dog Whitman. The rest of us couldn’t have known then how much that upset would epitomize how the season shook out for these teams. The UCSD Psychos qualified for Nationals last year for the first time in more than a decade, and they’re returning most of the firepower that got them a spot in Mason, OH. The team only graduated two players, which means playmakers like Dena Elimelich, Kelli Iwamoto, and Leanne Go have another chance to make their mark on the region. They won their home tournament, the KFall Memorial Tournament, in mid-November, but this weekend will be their first chance to test their veteran roster against the region’s best. The Psychos are seeded just below USC in Pool D, and that matchup could be the best game of pool play: last year they went 1-1 against each other throughout the season. The Psychos are an energetic and now experienced team; this weekend will be the first indicator of just how high they can go. BYU CHI has gradually built their program in the Northwest region over the past few years. BYU entered the season ranked no. 25 in the Ultiworld Preseason Power Rankings, which is a testament to the team’s talent despite their last place finish at Conferences and their absence at Regionals. Nevertheless, these women are determined to earn some respect, even if it’s only on Saturdays. Team captains Kaylie Caldwell and Kendra Mitchell, along with Ciera Orr, bring Club experience to the team from on Utah Elevate. Caldwell is a phenomenal speedster who bids with abandon, and she’ll help CHI push the pace on Saturday in Pool A. The BYU women will have to make their Saturday games count, but they’ve got an experienced and talented roster that has the potential for an upset over Colorado State. Can Outsiders Make Their Mark? This year, four teams are making the trip from colder climates for the chance to play in the sunshine: Colorado State Hell’s Belles, University of Chicago Supersnatch, University of Vermont Ruckus, and Washington University Iron Horse. While their chances to run deep in the bracket vary, each of these teams is traveling west with explicit motives for the weekend. For Vermont, the aim is clear: they want another bid for the New England region. “We are hoping to earn a bid for our region,” the Ruckus captains wrote to Ultiworld. “Two years ago, we lost in semifinals. This past year, we lost in the game to go. Our vision is a breakthrough in regular season that earns a bid for the NE region, followed by a post-season performance that results in reaching the bracket at Nationals.” Vermont has an experienced roster, and they could give UCLA a real challenge in Pool B.
Vermont has been knocking on the door of Nationals for the past few years, but they want to bust through it in 2018. Kyle Weatherhogg leads the way, a 1st Team All-Region selection last year, along with Brenda Hoang and Bettina Fahndrich. It’s easy to forget Vermont was just two spots away in the final rankings from earning a third bid for the NE; their worst tournament last year was their season opener, so if they want the bid this year, they’ll have to shore up their approach out of the gates. Colorado State also expressed a desire to earn a third bid for the South Central region this season, although their goals for this weekend center around development and chemistry. They return Kaci Cessna, fresh off a gold medal in Perth with the US U24 Women’s National Team, who can dominate with her size and huge pulls, as well as Kiera Lindgren, who was selected 2nd Team All-Region last season. They are a potential sleeper in the South Central, which has no clear team behind its top two. Chicago will also focus on their chemistry and skills in Santa Barbara. Supersnatch has a pretty young roster this year—they only have nine upperclassmen—and they acknowledge that they’ve got some work to do before they hope to be competitive in the Great Lakes. Jenny Wang, an All-Region 1st Team selection in 2017, will lead the charge for Chicago. Washington University Iron Horse is the last seed in the toughest pool, but they proved capable of breaking seed at Missouri Loves Company this Fall, and their scrappy roster is motivated to prove themselves in the stacked South Central region. Picking up Mary Hermann from Notre Dame certainly helped their cause. This weekend—this sunny January warm-up tournament—is just the beginning. Comments on "Santa Barbara Invite 2018: Tournament Preview (Women’s)"